Duke took a 17-0 lead into halftime where Collin Wareham knocked down a 25-yard field goal to get the scoring started. Two Army fumbles led to a Brittain Brown 12 yard rush and a 1-yard plunge from Daniel Jones to make the score 17-0. 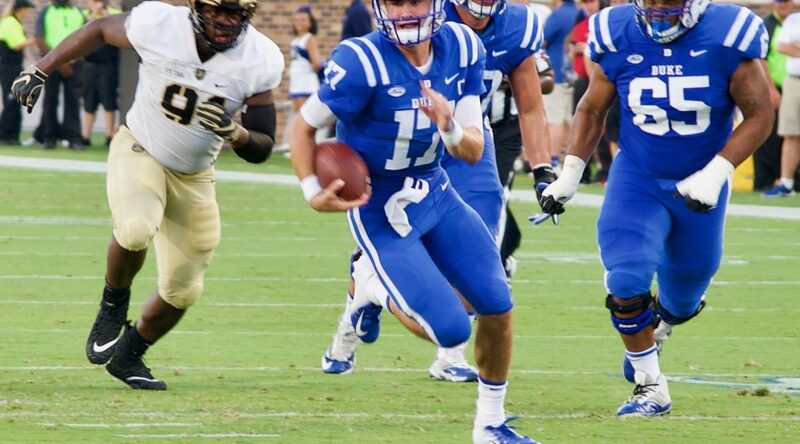 The Blue Devils came out sluggish in the 2nd half when Daniel Jones fumbled in Army territory. A scoring drive of 11 plays for 54 yards, chewed up close to seven minutes off the clock and a Kelvin Hopkins plunge made the score 17-7. Duke answered when Deon Jackson rolled into the end zone from 7 yards out after a 7 play 68-yard drive in only 2:09. "We responded well and I think that caught them off-guard," said David Cutcliffe in the post-game press conference. Army answered again on a Kelvin Hopkins to Cam Harrison 45yard pass play to make it 24-14 in just 2:16. The last time Army threw for over 100 yards was two years ago against Wake Forest. 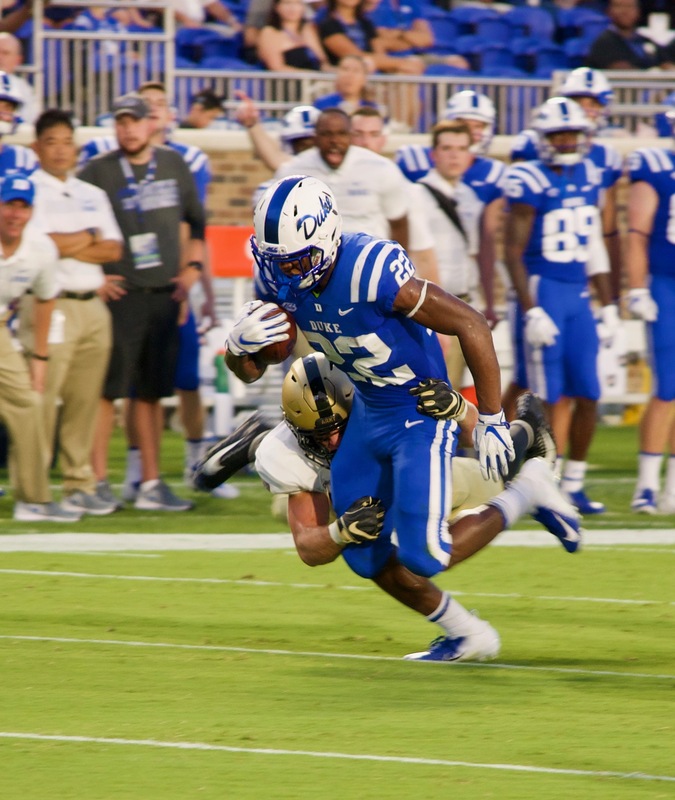 But the Blue Devils would not be denied and Duke went up 31-14 on a Daniel Jones 25 yard touchdown pass to Aaron Young who had his first career 100-yard receiving game. Ben Humphreys would later block an Army field goal attempt and Dylan Singleton returned it 33 yards to the Duke 35. Collin Wareham would later tack on a 30-yard field goal to make it 34-14. Daniel Jones finished the night 13-17 for 197 yards and one touchdown completion to Aaron Young who finished the evening with a career-high 114 yards in receptions. "Aaron is big, fast and has matured. We are more physical at every position including the receiver," said Cutcliffe. The Blue Devils were led on the ground by Brittain Brown with 75 yards and Jones added 43. Dylan Singleton led Duke with 11 tackles, while Koby Quansah added 9. The Blue Devils will travel to Northwestern next week in a battle of 1-0 teams. Cutcliffe said Army threw 21 passes against Duke and 24 all season a year ago, He mentioned his team had not worked on that part of the game as much but that his team still won by 20 points. The Duke coach also said players who did not play in this game could see action moving forward for it was hard to play a lot of players due to Army's style. Duke was just 2 of 9 on 3rd down conversions. Cutcliffe was especially happy with the kicking game. Duke is 4-0 in August under Cutcliffe. Duke is on a 4 game winning streak dating back to last season.